But then he told me about Mark Harris. I did not know my old spelling and punctuation checker had passed away and it made me sad just as it has always made me sad hearing about old teammates and friends. I had not talked to him in a long time, since he added a few commas here and there into my last book It Looked Like For Ever (also available at Bison Books if you are in the mood to throw another reasonable chunk of money around for a book described by the Philadelphia Sunday Bulletin as “a warm, funny, touching book without a trace of sentimentality”). He was a nice fellow, an older guy who loved Carl Hubbell who some compare me to in the anals of the game and he also said he played baseball too though this is something practically everyone with a pulse tells me so who knows how deep the truth goes. Anyway I always liked him and I always thought he believed in my novels that he polished as much as anybody ever done, maybe even more than me sometimes. But what can I say about him really, I asked this fellow who owns this blog you are reading now even though as far as I can tell there’s no money in it. I have not spoken to him in almost 30 years and never once cracked open any of the books he wrote himself and sent me besides checking to see if I was mentioned, which I wasn’t except sometimes on the back cover. “Well,” said this Josh Wilker fellow, who to his credit did not ever yell through the phone to check if I was the guy that got drilled in the eyeball in Most Awful Sports Injuries Volume Three but instead asked me about Red Traphagen and Sid Goldman and Sad Sam Yale and others until the answers started collecting into a big pile of gloom. “He didn’t do that much,” I snapped, forgetting to not speak ill of the dead for a moment, if saying that they didn’t do that much is speaking ill. “I mean, he was a wonderful fellow and loved baseball but I done most of the heavy lifting in those books.” I got aholt of myself before saying more but thought: How much does it take to put in a few commas and meanwhile my hand was always a claw after writing one of those books all winter? I thought about that for a while. One thing that was always big to me was my catcher, from Red Traphagen to Bruce Pearson who I roomed with to Piney Woods who I roomed with after Bruce died all the way to Tom Roguski, Coker’s son, who I also roomed with for a few seconds my last season before my starring role in Most Awful Sports Injuries Volume III. “Maybe you can write something about one of my baseball cards,” Josh Wilker said in a voice already halfway out the door and defeated. “I rather tell about the necessity of recycling,” I said. Thank you SO MUCH for doing this! You don’t know how much I appreciate it as a huge fan of you and also of your trusty bullpen catcher Mark Harris. Attached is a card of Frank Tanana that I thought you might have some thoughts about. He was selected straight out of high school by California with their number one pick in the June 1971 draft, the same month and year your career abruptly ended. As you may well know (I am actually hoping you may have continued to have some dealings with the California franchise after your retirement), Frank Tanana was an extremely hard-throwing left-hander who reached the big leagues as quickly and as young as you did and had quite a lot of early success (though not as much as you). He lasted a long time in the league, even a little bit longer than you, and had almost as many career wins (240 to your 247), though he did not enjoy any 20-win seasons or World Series victories, as you did. I’m not at all trying to make the case that he was your equal, but out of all my cards (which are largely from my childhood years of 1975 through 1980) he seemed like the one that had the most connections to you. He even started his career with California and ended it with New York, just as you started yours with New York and ended it with California. He was also born on July 3, exactly one day before your patriotic birthday. But actually the one main reason I sent along this card as the one that might give you something to talk about is that Frank Tanana and you are among a very select few in history who have ever been able, at least for a little while, to reach back and throw PURE HEAT. In the season just before the photo on the card I sent you (Tanana was just 21 years old through the first half of the season, just one year older than you in The Southpaw, Tanana went 16 and 9 with a 2.69 ERA and 269 strikeouts in 259 innings. In one game alone he fanned 17 men. There are more men who have walked on the moon than there are southpaws who know what it feels like to throw that kind of heat. Frank Tanana’s one of these few, and of course you are another. 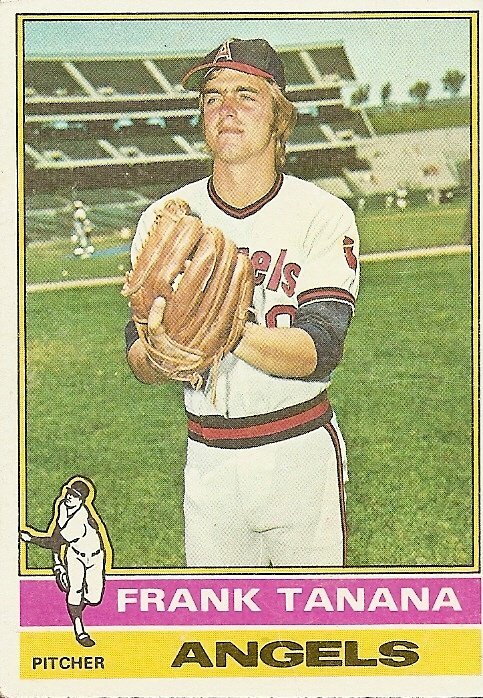 Also, Frank Tanana knows as well as anyone what it’s like to lose that fastball, having arm trouble by his mid-20s that turned him into a junkballer for the rest of his career. This seems like something you might be able to talk about too. Anyway, thanks again for doing this, Mr. Wiggen. I cannot tell you how much I appreciate it. Well, in answer to his questions I did not have much to do with California or with baseball a-tall after retiring. It wasn’t easy walking away but when I finally did it was like a door shut and I tossed away the key. I still watched a game from time to time but I cannot recall ever seeing this fellow Frank Tanana throwing either heat or slop. I do recognize something of course from the photo itself here and it is the look on Frank Tanana’s face. That is the look of someone like I used to be and maybe still am though now it means I am a old fool. That look is pure and unshakeable confidence. He is of course just standing there not even on a mound when the photo is being took but even there he is got his hands up and ready for his motion and his fingers on the ball and that is waking the feeling of pitching, of being ready to pitch. And when that feeling awakes in the body of a fellow who can reach back for the smoke and the smoke is always there then there is not a better feeling in the world for you cannot be beat. That is what I see in this card, a young man like I once was a thousand decades ago before such things as hips started crumbling who believed from head to toe he could not be beat. I guess I was really in the best shape of my life. I could of shouted and sung, for I felt so good. Did you ever feel that way? Did you ever look down at yourself, and you was all brown wherever your skin was out in the sun, and you was all loose in every bone and every joint of your body, and there was not a muscle that ached, and you felt like if there was a mountain that needed moving you could up and move it, or you could of swam an ocean, or held your breath an hour if you liked, or you could run 2 miles and finish in a sprint? And your hands! They fairly itched to hold a baseball, and there was not a thing you could not do once you had that ball. You could fire it like a cannon and split a hair at 300 feet, and you could make it dance and hop, and the batter could no more hit your stuff then make the sun stand still. You are currently browsing the archives for the Frank Tanana category.